Hardcover Size: 11.5" x 9"
A boy hears the ringing of a hammer in the evening air. He follows the sound to the blacksmith shop where the fiery forge makes it a warm place on a winter's night. The boy watches as his father pounds steel on an anvil. Tonight he is making shoes for Shadow Horse. When the big horse arrives, led by his owner, he stomps and whinnies. Then, after a few pats on his broad back and a sugar-cube treat, Shadow Horse settles down. The father lifts the left hoof and the shoeing begins. The night will be a special one for the boy, when his father helps him shoe his first horse. 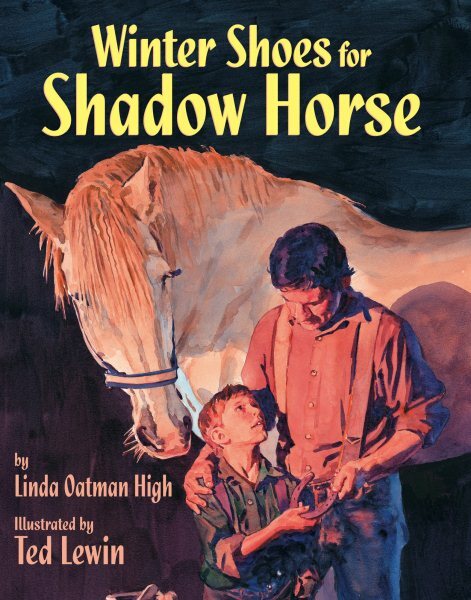 Linda Oatman High's beautiful story depicts the loving bond between parent and child, while Ted Lewin's luminescent illustrations capture the heat and flickering shadows of a blacksmith shop one cold night in winter.